A brush intended to mimic real-life brushes by drawing the trails of their lines or bristles. Use different shapes for different effects. Be aware that complex brush shapes will draw more slowly though, while the effects aren’t always visible (since in the end, you’re passing over an area with a certain number of bristles). To decrease bristle density, you can also just use an autobrush and decrease the brush tip’s density, or increase its randomness. The core of this particular brush-engine. Think of it as pressing down on a brush to make the bristles further apart. 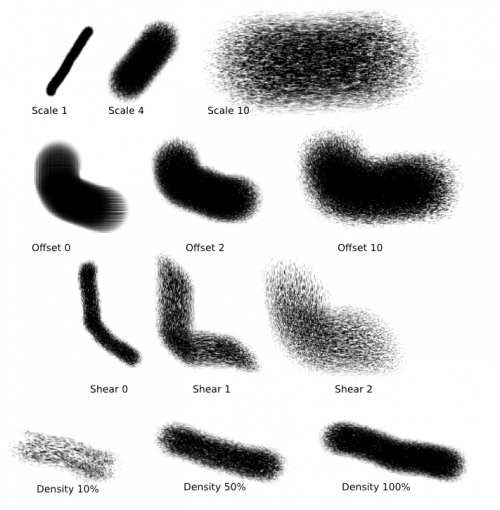 Use smaller values if you want a “dense” brush, i.e. you don’t want to see so many bristles within the center. Adds a jaggy look to the trailing lines. Shear introduces an angle to your brush, as though you’re drawing with an oval brush (or the side of a round brush). This controls the density of bristles. Scale takes a number of bristles and expands or compresses them into a denser area, whereas density takes a fixed area and determines the number of bristles in it. See the difference? This one maps “Scale” to mouse speed, thus simulating pressure with a graphics tablet! Rather, it uses the “distance between two events” to determine scale. Faster drawing, larger distances. This doesn’t influence the “pressure” input for anything else (size, opacity, rotation etc.) so you still have to map those independently to something else. This is a tablet feature. When you turn this on, only bristles that are able to “touch the canvas” will be painted. The bristles get connected. See for yourself. This will decrease the jaggy-ness of the lines. This simulated ink depletion over drawing time. The value dictates how long it will take. The curve dictates the speed. The brush will go transparent to simulate ink-depletion. The brush will be desaturated to simulate ink-depletion. The brush will pick up colors from other brushes. You don’t need to have Ink depletion checked to activate this option, you just have to check Soak ink. What this does is cause the bristles of the brush to take on the colors of the first area they touch. Since the Bristle brush is made up of independent bristles, you can basically take on several colors at the same time. It will only take colors in the unscaled area of the brush, so if you’re using a brush with 4.00 scale for example, it will only take the colors in the 1/4 area closest to the center. When the source is transparent, the bristles take black color. Be aware that this feature is a bit buggy though. It’s supposed to take the color from the current layer, but some buggy behavior causes it to often use the last layer you’ve painted on (with a non-Bristle brush?) as source. To avoid these weird behaviors, stick to just one layer, or paint something on the current active layer first with another brush (such as a Pixel brush).